I recently presented on Art Therapy for a monthly Parkinson’s support group that meets at Resurrection Hospital in Norwood Park. Parkinson’s disease is a progressive neurodegenerative disease that impairs motor function. The disease does not affect seniors exclusively; Michael J. Fox’s role as an outspoken educator and philanthropist living with early on-set Parkinson’s has made us all more aware of the wide reaches of this disease. However, the average age for symptoms to appear is 60, and the majority of people living with Parkinson’s disease are in their 70s and 80s. I became familiar with the potential benefits of art therapy for people who have Parkinson’s disease when I was working on my thesis project in graduate school. The drawing method I developed focused on making large drawings using both hands. Participants would fill as much of a 4′ x 4′ page as possible. Working large invites increased movement into the act of making a visual expression, and working bilaterally with the body stimulates greater synaptic activity in both hemispheres of the brain. 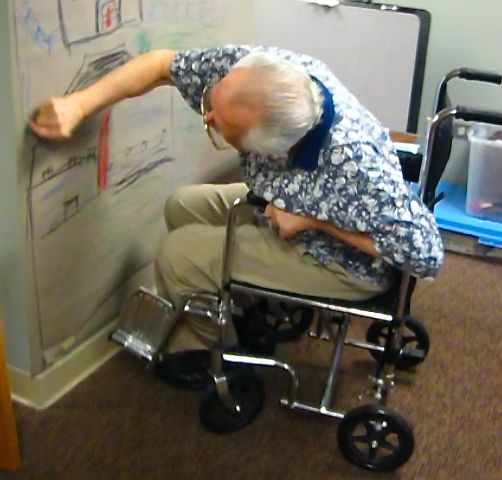 I believe everyone can gain from drawing this way, especially older adults who experience a gradual narrowing of peripheral vision and declining sense of balance and those coping with motor system impairments such as Parkinson’s disease. One participant in my thesis group had Parkinson’s disease. When he drew to fill the large page, he used his entire body. His head bobbed and his legs twisted rhythmically to the music playing on the radio during drawing sessions. The dyskinesia he often exhibited appeared lassoed into the dance of his creation. At the end of the hour, when he had filled the page with flowing, colorful lines making mountains or forests or farmland, his movements slowed and his teeth began to chatter. This was in stark contrast to the fluid and free gestures he made while drawing. In my presentation at Resurrection, I went over the following list, which details ways that making art can help a person cope with Parkinson’s disease. Find Pleasure: Art making should be enjoyable. There is no such thing as a “wrong” mark. Every expression is valid. Experience Control: Art making is an activity in which the artist can experience choice (through color, medium, line, etc.) and control over one’s environment. Value Individuality: Free creation can encourage spontaneity which can, in turn, improve confidence. Express Oneself: An experience of slowed speech or flat affect can limit one’s ability to communicate. Art is another language for communication which can be done at the artist’s own pace. Relax: Art making has been proven to lower blood pressure, reduce perseverative thoughts, and lift depression. Improve Flow in Mind/Body Connection: In a relaxed state when focus is on the artistic expression rather than on the physical movement itself, motion can become more fluid. Promote Concentration, Memory, Executive Functions, Improve Hand-eye Coordination: Art making increases bilateral activity in the brain. When drawing, one uses both the right and left hemispheres of the brain. This is a wonderful way to take greater advantage of mental resources. After a bit of talking, we did an experiential activity, drawing large with both hands. In the discussion that followed, one participant likened the experience of drawing large to a tai-chi class she had attended. The medical community is looking at the potential for tai chi to improve balance and prevent falls among people with Parkinson’s disease, as discussed on Harvard’s Health blog. My favorite comment came from a caretaker. She said that she had felt herself release so much stress while drawing, and she wanted to assure everyone that caretakers could also find therapeutic benefits from making art. Many of the benefits of making art that I described above are supported by the work of Anne Atkin, who lives with Parkinson’s and has developed a therapeutic method of painting. I encourage those interested to visit her blog and view this video of her sharing the painting method she uses in groups for people with Parkinson’s disease. Both are beautifully compelling. Before I leave you all, I want to draw attention to an upcoming show: The Art of Living with Parkinson’s. The Parkinson’s support group from the retirement community where I work will have a large group drawing on display. I hope to see you there. Many thanks to Stephanie Maurice for editing this post. Sophie Canadé works as an Art Therapist at Norwood Crossing retirement community where she facilitates Art Therapy and Expressive Arts groups in addition to 1:1 Art Therapy sessions. She is a graduate from the MAAT program at the School of the Art Institute in Chicago and a recipient of the “Hilgos Award” fellowship for artistic creation with older adults. In addition to open art studio groups, Sophie facilitates a Parkinson’s support group, a knitting/crocheting/fiber arts circle, and the Porch Group where Norwood Crossing’s residents’ newsletter is produced. Another excellent post, Sophie! Your thoughtful insights and creative perspective makes for an interesting and enjoyable read. It’s evident that you are doing wonderful work.